Donald Trump’s executive order banning nationals from seven Muslim-majority countries has already had immediate, far-reaching implications for thousands of people, including refugees fleeing slaughter and oppression, visitors with approved visas, and even green card-holding legal residents attempting to return from overseas travel. Among those people is Iranian director Asghar Farhadi, whose latest film, The Salesman, is nominated for Best Foreign Language Film at this year’s Oscars—a ceremony he will now be barred from attending. Earlier this week, The Salesman star Taraneh Alidoosti told The New York Times that she would be boycotting the ceremony regardless of whether Trump’s ban—then still just a threat—prevented her from obtaining a visa to attend. “I decided not to go even if I could, because it hurts me deeply to see ordinary people of my country being rejected for what might be their legal right to have access to their children abroad or to their school classes as students,” Alidoosti said in a statement. At the time, Farhadi had no comment on his own plans to attend the Oscars, where he had previously claimed Best Foreign Film for 2012’s A Separation. But now that Trump’s order has been put into effect, Trita Parsi, president of the National Iranian American Council, confirms that Farhadi will also not be allowed to enter the country. Hussein Hassan risked everything to present the true face of the war. Hassan is not a fighter at the front line. He fights with his artistic soul against terrorism and crimes. The U.S. are the closest and most important allies for Kurdistan. Now it seems to be impossible for a Kurdish artist to visit the U.S. to present his work… We as Kurdish filmmakers hope that Donald Trump will acknowledge the Kurdish people. Farhadi has yet to make similar public comment. In a recent interview with The A.V. 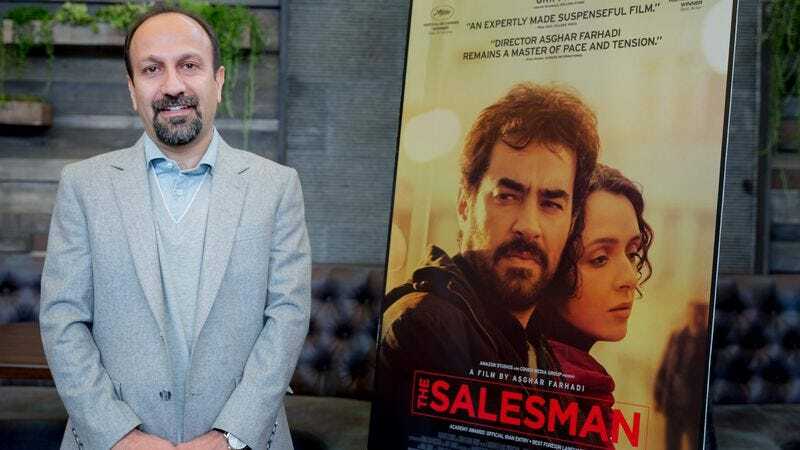 Club, Farhadi described the broader themes of The Salesman, which follows the unraveling of a married couple after their home is invaded, by saying, “It seems that when we want to have calmness in this world, we make a wall around us. This gives us a very calm environment, and when we feel that somebody is intruding into that, it makes us very angry and we feel we have to do something about it.” The ramifications of America’s own lashing out are just beginning. Meanwhile, People reports that the White House has suggested Farhadi could still enter the country for the ceremony, with a source claiming that Farhadi would qualify for a waiver exempting him from the ban.